I had absolutely no idea what to expect with Bird when I sat down to read it over the weekend. It could have been a ghost story. It could have been a heart-wrenching tale of family tragedy. It could have been silly, or mystical, or preachy, or boring. I chose to just dive right in and see what happened. Bird not a terribly long book, and as it’s written for middle grade readers I was able to get through it in one evening. It turned out to be quite different from any of those adjectives, though I’m not sure which ones would fit better. Personal, maybe, or truthful, or heartfelt. I don’t usually like to use the term heartfelt. It sounds sentimental most of the time. But this is the sort of book you feel in your heart, though I was happy that the author doesn’t try too hard to reach inside your chest and prod that bloody muscle into pieces. Jewel’s narration is poignant enough without much meddling. Even though Bird had its slow moments and got a little introspective for my tastes, I found myself watching Jewel’s family and friendships build themselves up from near breaking with devoted interest, and cheering inwardly for every small victory along the way. Jewel’s grandfather didn’t murder her older brother John, but he did give him the nickname “Bird” and joke that the little boy could fly. So, when Bird actually did jump from a cliff and die — at the same hour as Jewel’s birth — Grandpa got the blame. Jewel’s dad believes that his father called unwanted attention from duppies, which are ghosts and tricky spirits common to their native Jamaican folklore, by bestowing the unusual nickname. Now Jewel is twelve and her home is still rife with silence and tension, so many years after the accident. Her grandpa hasn’t spoken a word since Bird died, and the old man exudes anger and sadness from behind his closed door and closed mouth. Jewel’s father insists that she learn about duppies and how to avoid them, while her mother insists that spirits don’t exist and wishes Jewel would focus on the real world. So much goes unsaid in Jewel’s household, it’s no wonder she sometimes feels like Bird’s memory matters more than she does; the living sister who never met her brother but feels his presence everywhere. When Jewel meets a boy named John perched in her favorite tree, she can’t decide if it’s coincidence, fate, or something a little magical which has brought them together. John claims to be staying with his uncle in the small town, but some details of his story are puzzling and vague. His appearance quickly catches the attention of everyone in Jewel’s family. Her mother really smiles for the first time in many years when she talks to Jewel’s new friend. Her father gets suspicious. And Grandpa gets furious,vigorously duppy-proofing the house and making it clear that John’s not welcome near his family. But John understands Jewel’s passion for geology — a passion her family disregards entirely– and together they manage to have fun in the moment rather than dwelling on tragedy. So she isn’t ready to give up her new-found friendship just because the grandfather who has never spoken to her sees a trickster ghost in John’s appearance. Nor is she willing to question the strange discrepancies in John’s stories about himself, until it might be too late to ask. 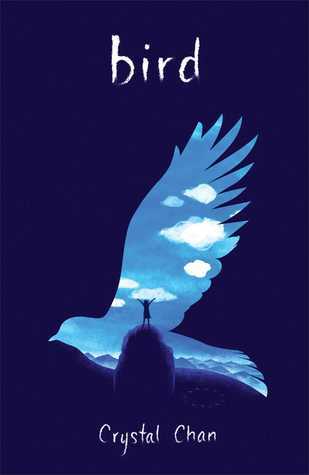 Bird is a story about belonging and forgiveness. As Jewel and her family try to work through the memories which are burdening their present, Crystal Chan shows how what we choose to believe in can change the way we see life, the afterlife, and the people who make life worth living in the first place. For all its talk of ghosts and untimely demises, Bird is not a fantasy at all, nor is it much of a wild ride. The entire tone is resolutely true to life, which makes Jewel’s father and grandfather even more interesting as characters when they dwell on the superstitions of their heritage. I think that one of my favorite things about Bird was the inclusion of Jamaican folklore, and the way it blended or clashed with reality. The writing might be realism, but names hold just as much power here as they do in fairy-tales, and there’s always a little hope of magical intervention as long as characters believe in it. Jewel’s mother is partially Hispanic, but doesn’t speak Spanish, and her father is Jamaican, so our young heroine sort of stands out in her Midwestern town. Chan handled the mix of cultures pretty well; all the vivid details about heritage served to give the characters memorable personalities rather than just appearing like forced “fun facts” scattered throughout the text. Jewel’s mixed race background in a predominantly white town was mentioned with a matter-of-fact and candid honesty I very much liked about the character. John, too, voices some really poignant observations about the nature of belonging. In the way he brushes off any awkward questions about his being adopted by a white family, and then the true frustration which he eventually reveals, the novel shows that even kids whose parents pay them plenty of attention can feel legitimately alienated. One moment which really stuck out to me was when John explained to Jewel that he acts cheerful and nonchalant about his background because no one wants to hear his real opinion about it. There’s a lot in Bird about how hard it is to live up to adults’ warped expectations, especially when you’re young and full of life with not enough living going on around you. At the same time, the hardships grown-ups have to face are treated fairly. When Jewel and her Grandpa finally find a way to communicate, I felt a weight lift off my shoulders, a weight I didn’t even realize had descended upon me while I read. Grandpa was definitely my favorite character, even though he wasn’t very likable for the majority of the book. For a man of very few words, he had such an emotional history and it was wonderful to watch Jewel’s perceptions of him change over the course of the novel. Bird is a sort of quiet, detailed, sensitive novel. Kids who need action and peril to hold their interest in a story would find it hard to race through the pages. There’s death, and a few near-misses, but not much in the way of swashbuckling or saving the world. Instead, Jewel and John and the small cast of other characters are trying to salvage and re-build their own little worlds, pursuits which are equally important. Fans Kate DiCamillo’s more serious books and Sharon Creech will enjoy Bird, and follow Jewel’s discoveries with sympathy and interest. I’m recommending it to thoughtful kids and to their parents, too, because Bird is full of moments which shed light on how the living — and the dead — from very different generations sometimes struggle to see things as they truly are. Age range recommendation: 9 and up. “Creepy kids’ book delivery!” my co-worker announced when she dropped The Thickety in front of me at the bookshop. The intricate, foreboding cover of the advanced reader’s copy was enough to move it to the top of my reading list. I seem to have developed a reputation as She Who Reads All The Weird Children’s Books. It’s a fitting title, I suppose, and I do enjoy the perks which go with it. The Thickety is set to come out in May, 2014. 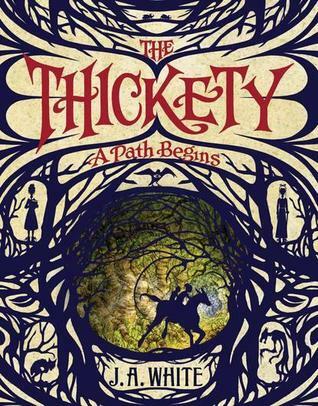 The Thickety is a Middle Grade novel set on the fictional island of De’Noran, where people are still terrified of magic and follow The Path of Timoth Clen: destroyer of witches. Unfortunately, Kara’s known around the island as “the witch’s daughter.” Her mother was put to death for committing some gruesome murders with magic, and Kara’s family has been largely ostracized by their superstitiously devout community ever since. Kara just wants to be left in peace with her beloved little brother, to bring her father back from the brink of despair, and to get through a day without Grace – the religious leader’s manipulative daughter – making her life unbearable. I really wanted to love The Thickety, as the premise and setting really excited me, but I ended up only liking it. Still, there’s a lot to like. The religious mythology and superstitions which rule De’Noran seem underdeveloped at times, but are creative and appealing nonetheless. If there’s a sequel, I hope that the legends behind Sordyr will be discussed in more detail, because while I love the idea of an evil nature king dwelling in accursed forests, his influence in the story tends to be told rather than shown. The village traditions of reenacting parts of their mythology filled in some of the gaps – almost in morse dancer-style pageantry – but I just felt that such a cool character ended up being wasted. The forest itself also gets less page-time than I would have liked. There are all these great descriptions of really unusual creatures which come from beyond the trees, and the small amount of time Kara does spend within the boundaries is filled with uncanny wonders befitting the likes of Mirkwood Forest. But, disappointingly, the Thickety spends most of the book looming ominously around the town rather than acting as a stage for what could have been some really atmospheric scenes. 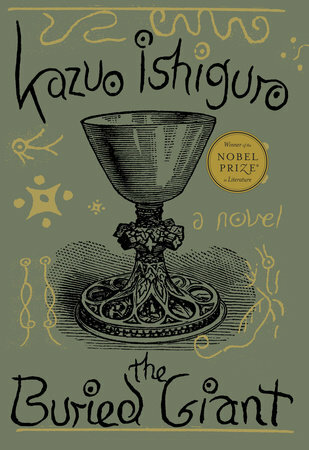 However, the novel’s subtitle is “The Path Begins,” so I’m hoping that a sequel might take us headfirst into the world of glowing webs, frightening tree-men, and many-mouthed monsters. I did study European witch trials a bit in University, and spend a great many summer weekends in Salem Massachusetts, so I found J.A. White’s take on the witch-hunt mentality pretty interesting. While reading, I couldn’t help but pity Kara’s closed-minded neighbors, since most of them genuinely do act out of terror rather than malice. Pity and fear are the two forces forever at odds in this novel, creating much more complicated dilemmas than the popular Middle Grade conundrum of good vs. evil. Kara herself isn’t a perfect heroine, but her motivations are clear and realistic. I always appreciate sibling friendship in children’s fiction, and you can’t help but love Kara’s brother Taff almost as much as she does. Any otherwise selfish decisions she makes are easily forgiven, because everything she does is to protect him. If that’s not enough, her father often needs to be taken care of, too, so Kara has to act like the grown up all the while navigating a very hostile little world. It’s not hard, then, to understand the appeal of dangerous magic. When the grimoire’s pages offer a chance to take back some power, I think anyone reading the book would have trouble refusing the temptation. While some cowardly characters redeem themselves by setting aside their ingrained cruelty in the face of hardship, the meanest meanie in The Thickety is a perfectly despicable antagonist. She adds a relentless layer of unfairness to the story. Sometimes, I wondered if J.A. White has a personal crusade to remind his young readers that there’s no justice in life. It’s not a hopeful story, that’s for sure. And even when things seem like they might work out for the best, something happens to destroy that dream. I’ve got a rather bleak world-view myself, but I’m not sure this is the sort of message I would have appreciated as a youngster well on her way to becoming eternally disheartened. Yes, magic is complicated and sacrifices are often hard to understand. But with one misfortune after another, without any real breaks for humor, it got difficult to remain optimistic that Kara’s inspiring perseverance would ever pay off. The Thickety comes out in May, and I look forward to seeing it on our shelves. It won’t be book I recommend to every young reader, because the story is so grim and the story’s conclusion does nothing to alleviate the novel’s generally distressing tone. But there are certain readers who will probably love this book. It reminded me quite a lot of Terry Pratchett’s book Wintersmith, but was lacking the humor and levity which lightened that tale. The weird community vibes brought to mind images from that M. Night Shyamalan film The Villiage. And, of course, there are the obvious parallels to the true witch-hysteria stories from our own world, explored in books and plays like The Daylight Gate and The Crucible. Fans of smart adventures and thought-provoking magic will enjoy The Thickety, as will anyone eight and older who is itching to understand how beliefs can shape the world. This book raises important questions and compelled me to read late into the night, hoping foolishly that things might work out for the best. Even though I turned the last page in fit of despair, I did enjoy reading The Thickety and will be excited to hear what our Middle School readers think of it in the Spring. It’s a surprisingly heartfelt story, and I don’t have much of a heart with which to feel. 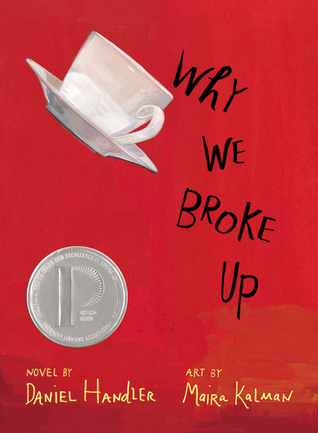 Why We Broke Up is probably the most mainstream of Daniel Handler’s books: it distills all the sublime dialogue and weird adolescent energy so prevalent in The Basic Eight into something more realistic. In The Basic Eight, the teenaged characters are extravagant, and their lives go totally nuts as the plot gets weirder and weirder. (Read my review of The Basic Eight here. It was my favorite book I read in 2013.) The opposite seems to be the case in Why We Broke Up. Stylistically, the books are similar. You’ll recognize your favorite weird Handler/Snicket-isms sprinkled throughout. Big words. Pretentious drinks. Vintage pop culture. Interesting food. But Min, Ed, and the other characters just feel so vividly real, so tragically similar to the people you encounter on a daily basis – just with better one-liners. Even the minor characters are excellent, and perfectly evoke the awkward balance teenagers almost always fail to strike between love, family, and friends. And, since they’re minor characters in Daniel Handler’s capable hands, you know they’ll be witty and judgmental and possess obscure talents. In this particular book, though, teenagers are distinctly teenagers even when they’re making igloos out of cubed eggs for an aging film star’s secret birthday party. My favorite part of the book? They steal a sugar dispenser at one point, to make a cake which requires stolen sugar. That’s just one of the Various Fictional Details which make Why We Broke Up an indespensable part of the Handler/Snicket universe I love so much. Adults in this book are almost entirely useless, and that never fails to make me happy. We’ve got kids navigating the treacherous world of romantic nonsense guided only by their disobedient hearts and terrible judgement. We’ve got nerdy references and sordid affairs. If you want more nerdy references and sordid affairs, check out the Why We Broke Up Project, in which many of my favorite writers and some hapless readers share their own tales of heartbreak, woe, and bad music. Isn’t that what this holiday is all about? So happy Valentine’s Day, readers. Don’t screw it up. What took me so long to read Their Eyes Were Watching God? This is one of those books I think a lot of us read in high school, but I never did. I’d occasionally think “hm, I should read that,” when I was cooped up in the university library, but there was always something more academic demanding my attention. Well, no longer am I beholden to the rigorous demands of academia! I’m slightly beholden to the demands of staying on top of my Stacks To Read Before Publication, but no one’s giving me marks for those, at least. So I finally read Zora Neale Hurston’s book and fell in love with it. 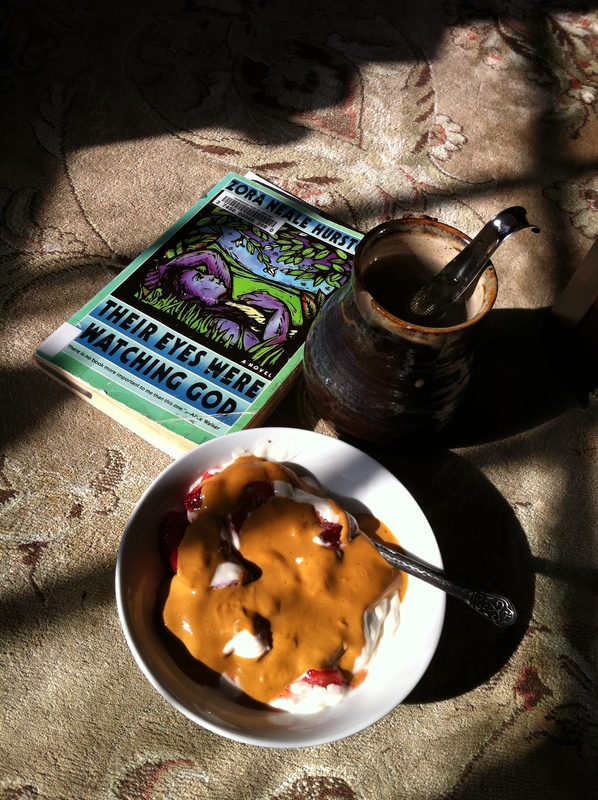 I finished it this morning, curled up in a sunny spot with my breakfast and cacao tea. It’s not a fast-paced book, but the language was so ridiculously beautiful it cut open my heart. The first few sentences of nearly every single chapter resonated with me in particular, for some reason. The novel’s opening paragraph has always been one of my favorite quotes, but I never read the rest of the book until now. Wow. There’s a lot of this book which made me stare into space and just…. wow. I could make a list of all my favorite passages but it would be only a few pages shorter than the whole book. I’m not a fan of stories about romantic attachment, usually, but even though Their Eyes Were Watching God follows Janie’s experiences married to three different men, the story is really about her. She’s a black woman in Florida only a couple generations after slavery was abolished, and she learns not to be afraid of following her own path, no matter how other harshly people choose to view her. There’s a whole cast of lively characters, really moving conversations, and a stunning tropical storm which tears through the Everglades and Janie’s life without warning or fairness. I love storms. I love snappy dialogue. I love deep, complex characters. I just loved this book, OK? I don’t have any intelligent thoughts to share or clever observations to make. But I’m so happy I finally read this and learned what all the fuss was about. Zora, you’re the queen of sentence structure. Maybe it’s better that I never had to read it for school, because sometimes that makes me resent a story. Instead, I just got sucked into Janie’s warm world, full of hardships but also friendship. I’ll probably be hearing her voice in my head for the rest of the day. 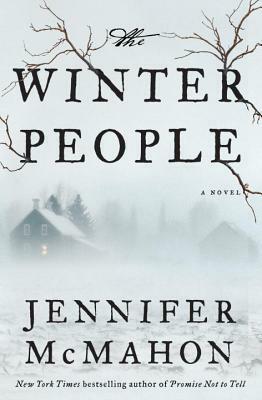 I read The Winter People a week ago, but was holding off on a review until I could let the story settle in my mind. In the meantime, I actually got to meet Jennifer McMahon at a cocktail party in Boston. This means I had a chance to berate her with questions about the book over crudités and macarons. Questions like “why the heck was that doll so sinister?” and “When do you think you’ll allow your young daughter to read your super creepy books?”. She was so much fun to speak with; warm, kind, funny, and not at all unnerving despite the general tone of her fiction. To be quite honest, I think The Winter People would only be getting 3 stars from me, had I sat down to write this review right after I closed the book. But, after meeting Jennifer, I have a new appreciation for some of the little details which vexed me. So bonus points for being delightful. The Winter People is sort of a literary thriller, if I’m using that term correctly. I don’t generally read much suspense fiction, preferring ancient-folklore-is-real-and-scary style horror to the find-them-before-its-too-late genre. The Winter People had a good mix of both, though, not to mention a healthy dose of oh-crap-don’t-go-out-in-the-woods. The novel’s events stem from the tragic story of Sarah Harrison Shea, after her daughter disappears in the woods one winter in 1908. Excerpts from Sarah’s secret diaries and her husband’s own experiences show how a mistake from the past can utterly ruin someone’s chance for future happiness, especially when that mistake involves betraying a pissed-off medicine woman and failing to appropriately dispose of her mystical belongings. Oops. Sarah’s friends and neighbors start to worry that she’s sinking into madness after Gertie is found dead, but there is someone scratching at the closet door and something killing animals in the snow. Could it be that Sarah’s Auntie really taught her how to summon life back into the bodies of the dead when she was a child? And how much misfortune must befall a devastated lady before we can forgive her for trying her hand at necromancy? It should not come as a shock to any fans of supernatural mysteries that the price for tampering with natural fate is almost always much worse than the original tragedy. Sarah’s dairy entries are revealed through a modern lens in The Winter People by way of two other personal encounters with whatever dreadful forces are at work in the woods of West Hall, Vermont. Nineteen-year-old Ruthie and her sister Fawn live in Sarah Harrison Shea’s old farm house, and their mother has just gone missing. Nothing to worry about; it’s not like they’re totally isolated, living near a stone circle called “The Devil’s Hand,” without computers, but with Fawn’s imaginary friends to keep them company! Oh wait – yes they are, and I got very nervous right away for the girls’ wellbeing because I was immediately invested in their characters in a way which I couldn’t quite care about Sarah Harrison Shea. Ruthie and Fawn are realistic and likable. The elder sister’s valiant attempts to remain level-headed in times of crisis only made their eerie situation all the more urgent and uncanny, especially since things quickly escalated from the vaguely mysterious circumstances of their mother’s disappearance to a desperate hunt for answers underground, at gunpoint. The modern chapters of The Winter People are full of action and investigation, while Sarah’s diary entries focus on a slow build of supernatural suspense and emotional disturbances. In nearly all of my reading experiences, I’m more receptive to the latter sort of story. Give me ancient curses and haunting visions, and I’ll be in my reading chair for the rest of the afternoon. But I think that McMahon actually did a much better job bringing the characters and the story to life in Ruthie’s chapters of the book. Naturally, the big concern was over Fawn’s safety as things rapidly progressed beyond the sisters’ control, but I also rather liked Ruthie’s UFO-spotting redneck boyfriend and even her exacting, slightly paranoid mother. Maybe I knew that the Harrison Shea family was doomed from the start and gave up hope on a happy ending for them, but I was holding my breath for Fawn and Ruthie. Whenever the little girl mentioned a creepy little fact she supposedly heard from her doll, and every time they discovered a new claustrophobic secret passageway in the house, I wanted to jump into the pages and help them get out of there ASAP. There’s one scene in which Ruthie and her boyfriend honestly pry some boards off of a closet door which has been obviously barricaded from the outside to keep something in. Ack! The biggest flaw I found with The Winter People would have to lie in the minor characters who are meant to push the plot forward. I couldn’t bring myself to care one way or another about the grieving artist who moved to Vermont and finds her fate intertwined with Ruthie’s and Sarah’s, despite the fact that I understood her importance to the mystery. This book is as much a study of grief as it is a scary story, and this woman had lost her husband after he got tangled up in the supernatural draw of West Hall. Her attempts to rediscover his last moments brought some important catalysts to the plot – and provided opportunities for exposition – but I just found her character to be a little too convenient. The same goes for the baffling woman who holds the answers to some of Ruthie’s questions, a rich and possibly delusional lady who is also struggling with having a child taken away from her. (McMahon writes a lot about lost children – several of her other novels seem to follow a similar theme.) Sarah’s niece, who could have been really interesting given her fascination with mediums and the spiritualism of the early 20th century, also fell a little short of my expectations. Of the three supernaturally-inclined ladies in the novel’s historical chapters, Auntie was the most intriguing, but even she wasn’t developed enough to be entirely believable as such an important character. The superstitions behind the “sleepers” wasn’t explained in enough detail for my liking, but I tend to get overly enthusiastic about folklore and magical lore, and I don’t think that the book suffered too much for the vagueness of those details. Maybe if Auntie had a bit more time in the spotlight, some of my questions would have been cleared up. But I doubt many other readers will be bothered by the occasional lack of clarity, there. It’s really too bad that the minor characters fell flat, because the major characters were complex people with emotional depths which made their desperate – sometimes ill-advised – decisions stressful and compelling. The little sensory details – like a girl-shaped figure in a blurry photograph or the sound of something scuttling around a dark room – amped up the tension in the book even when the plot itself threatened to fall into somewhat conventional patterns. I really liked the way Jennifer McMahon could focus on how one small thing out of place can change the atmosphere entirely, and she carried those details from the historical chapters all the way to the modern, exciting conclusion. As I reached the novel’s end I started to get really stressed out that things might not get resolved before I ran out of pages, but the ending was fairly satisfying if not a little hard to believe. But, honestly, this is a book about grieving women raising the dead and terrified teenagers trying to put them back down again. Suspend your disbelief for a while, especially if you like smart thrillers and can handle some chilling descriptions. Curl up with The Winter People and a blanket next time a snowstorm keeps you cooped up inside.